Robbie Perkins was named the inaugural captain last year. Photo: Joe Vella SMP Images / ABL Media. In a significant boost for the Canberra Cavalry, captain Robbie Perkins has re-signed with the club for a further two years. The 24-year-old has played for the Cavalry for the past seven years and was part of the 2013 Australian Baseball League Championship winning team and the 2013 Asia Series winning team. Perkins, who was appointed the inaugural team captain last year, said he was thrilled to be back in the Cavalry orange and credited his supportive teammates who helped him in his transition into the role. “It feels great to be back for the Cavalry, it’s where I want to be and I’m looking forward to the upcoming season,” Perkins said. Cavalry CEO Donn McMichael said that signing Robbie was his main priority and commended his leadership. 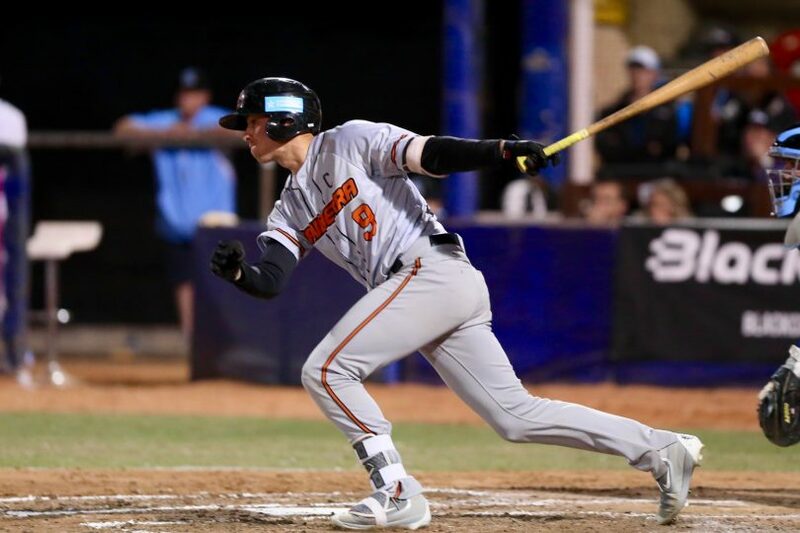 “Signing elite players who have come through Baseball Canberra’s high-performance program has been our number one priority when it comes to our playing roster,” McMichael said. The 2019/20 Australian Baseball League is set to return in November 2019. The Cavs are looking to go one further this season as they set their sights on the Championship Series after bowing out one game short last season against the eventual champions the Brisbane Bandits.